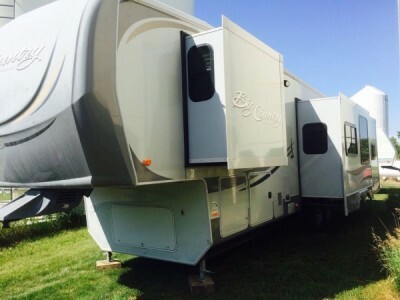 2006 Carriage Carri-Lite 36ILQ Fifthwheel. 3.5KW Onan generator, power patio awning, gas/electric water heater, 50 amp service, pass-thru storage, aluminum wheels, black tank rinsing system, exterior shower, water hose, roof ladder, soft touch ceilings, surround sound, leather sofa with sleeper, free standing dinette, Love seat style recliner, day/night shades, Fantastic Vent, ceiling fan, fireplace, kitchen island, convection microwave, 3 burner range with oven, central vacuum, sink covers, refrigerator, glass door shower with seat, Queen size mattress, 2 ducted roof A/Cs and. Triple mint condition. This deal is here for you to have. 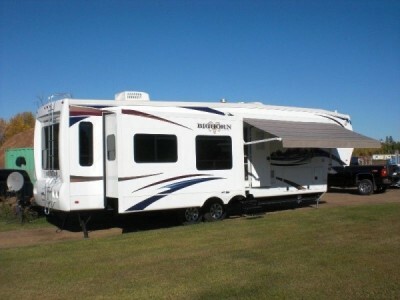 This unit offers 4 slides, insulated skirt, Roof top satellite, Onan inverter, Original tires, immaculate inside and out. Viewing anytime by appointment. Please call 780-908-2755. 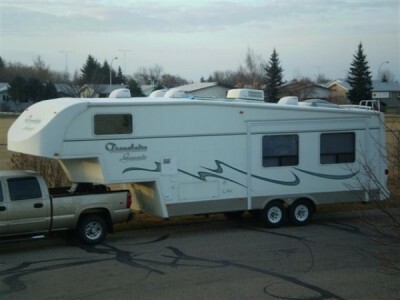 2002 Travelaire Genesis GW292 Fifthwheel. Have a new loaded 35.6 foot fifthwheel trailer for sale or trade at half of the original price. We bought this top of the line unit to travel south for the winters but never went and now can not. If the year does not matter to you in order to save big, this is a great deal for you. Extras added on to the new unit, a totally self powering solar system that allows you to live off grid, and a rear tow hitch. A few weeks after buying it I went on a 3 day shakedown weekend and we have not used it since. I have it sitting on blocks in the shop since the first summer we bought it. This Travelaire trailer was built in Alberta for Alberta conditions, no shrinking lyno or other cold weather problems. As well as all the other options,( see pictures), it has winterized holding tanks and winterized thermal windows, made for cold weather use. 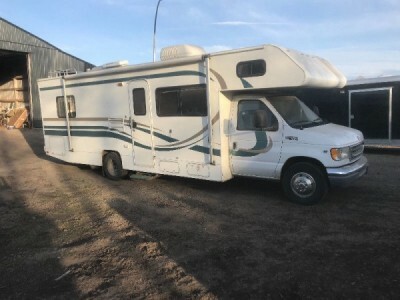 Will sell unit outright or trade for a low mileage small diesel camper unit or a truck camper with a toilet, made for a 6 foot Chev. truck box for local small trips. This loaded fifth wheel was $80,000.00 new and letting it go for $40,000.00 and it is still in new condition. Please call 780-826-3624 if you require more information. 1996 Monaco Windsor 34Ft Class-A Motorhome. No slide. 8.3 Cummins. Selling for someone else. I would appreciate serious inquiries only. If this ad is up it is still available. More pictures and specs will be posted as they become available. Offers will be considered. Unit is located in LaCrete, AB. Please call 780-926-7747 to view. 2011 Heartland Big Country 3494QBS Fifthwheel. 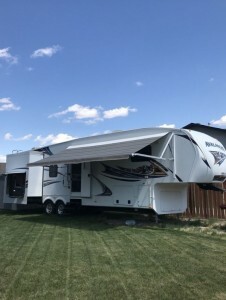 Spacious 4 slide trailer, top of the line features all the way through, kids have their own space, and ent Center, large kitchen and dining area, walk in shower, large master bedroom, ext speakers, new awning, and outdoor accessible fridge. Lots of storage in and out. Please call 403-512-1021 to view. 1998 Beaver Monterey 37Ft Class-A Motorhome. 37 ft, large hydraulic living room/kitchen slide, new rubber, new batteries, back up camera, 2 ac units, hydraulic leveling jacks, onboard generator, 300 hp cat engine with Allison auto transmission, well maintained and in excellent condition. Please call 778-868-2579 to view. 2007 Itcasa Sunova 26P Class-A Motorhome. 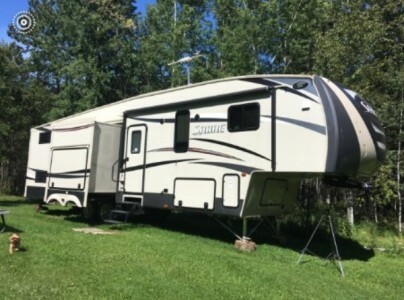 This RV is 26 feet in length with a Vortec 8100 engine, Workhorse chassis, 4KW Onan generator with 350 hours, patio awning, slide-out room toppers, gas/electric water heater, hydraulic leveling system, convection microwave. New tires, no pets or smoking. Immaculate. Please call 780-709-2140 to view. 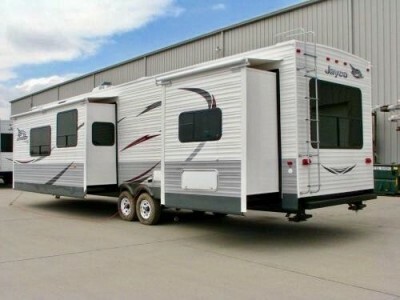 2012 Keystone Avalanche 345TG Fifthwheel. 3 slides. Rear living area. Sleeps 4. Queen bed. 12 gallon hot water tank, fireplace. A/C, 4 person dinette with table extension. Out door kitchen with fridge and cooking stove. 30lb propane tanks, two fantastic fans, electric awning, electric jacks on rear, microwave, lot and lots of storage inside and out. This trailer has been very well looked after and is in excellent shape. Not many trailers out there with rear living and an outside kitchen. Possibility of taking over payments to the right person. Please call 403-990-4272 to view. 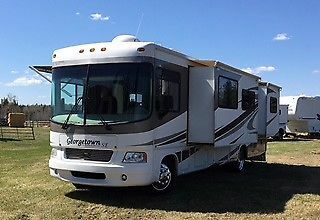 2007 Forest River Georgetown 34Ft Class-A Motorhome. great motorhome. Ford V10 Triton with tons of power, opposing slides makes for a huge entertaining area. Sleeps 6 and we made a custom king bed instead of the standard queen. Everything works great and no issues, took it to Grandforks BC last summer and pulled the steep terrain without a problem. New coach batteries, new engine battery, new front tires all last summer. Tons of storage, self leveling jacks, a dream to drive and ready to roll. Located just south of Sundre. Please call 780-402-0516 to view. 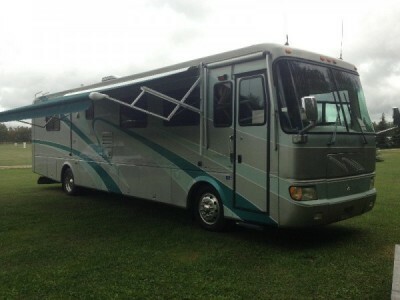 2002 Forest River Windsong 32Ft Class-A Motorhome. 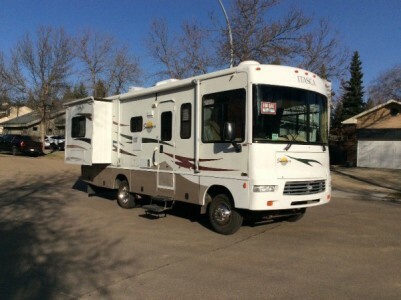 Great condition, Queen size bed, lots of storage, backup camera, self levelling. Please call 403-394-5448. 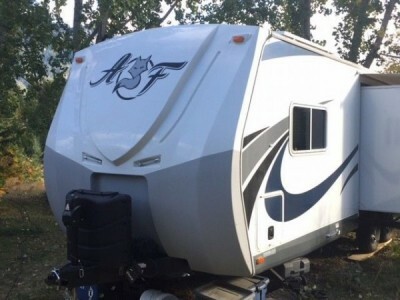 2015 Forest River Sabre 34RDKS Fifthwheel. This unit is in brand new condition. Willing to trade for land, smaller unit / cash. Light weight 3/4 ton towable. 4 slides. Some of the extras. 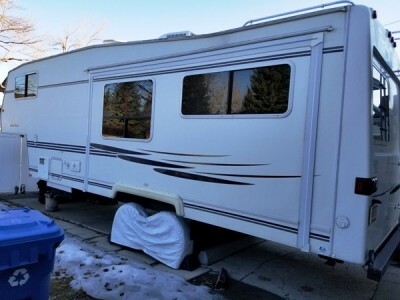 Washer/Dryer, custom exterior tarp, satellite dish/ receivers, tripod, too many to list. Please call Cliff 780-920-1567 to view. 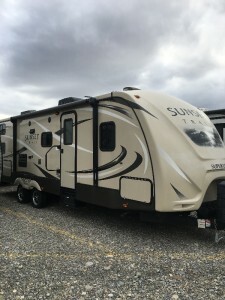 2013 Forest River Sandpiper 356RL Fifthwheel. Bought brand new in 2016. used only 2 years. 2 air conditioners, king bed, outfitted for washer/dryer, electric theater seating, couch folds out to bed, sleeps 4. Please call 403-519-5261 to view. 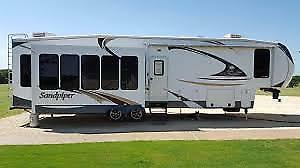 2006 Jayco Jay Flight 27BH Fifthwheel. Like new condition. Just in time for the Long Weekend. Towable with 1/2 ton vehicle. 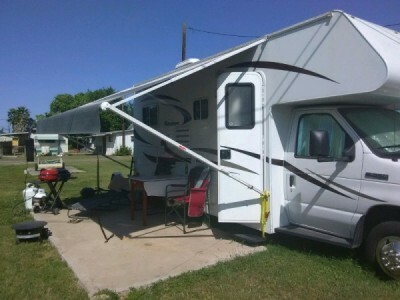 Queen Bed, Single over Double Bunk beds, Air Conditioning, 3 Burner Stove and Oven, Microwave, Fridge/Freezer, Surround Sound Speaker System, AM/FM/CD/DVD Player, Outdoor Shower, 30lb Propane tanks (2), RV BBQ, New Battery, spare Tire with Cover, Round Bar Weight Distribution Hitch and Safety Chains. Ready for camping. Just hook up and go. Please call 403-690-9386 to view. 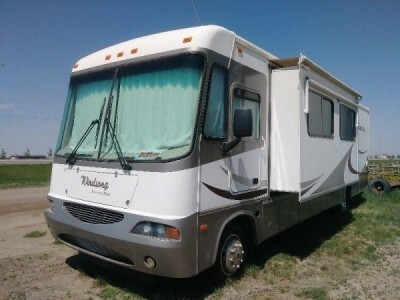 2000 Fleetwood Troga 33Ft Class-C Motorhome. New tires. Complete service front to rear full synthetic oils . New plugs and coils Complete banks exhaust system all done last spring gets 12-13 mpg with exhaust and 5star motorhome tune. Runs excellent very strong Led lights all around including led tail light upgrade as lenses were cracked on incadecent ones. Everything works. No leaks. Front bunk window delete done as they always leak (done by a licenced rv tech). Selling as we are downsizing no more kids hate to see it go REDUCED TO $21000.00 for quick sale have seen similar units listed for more. We are selling for what we feel we would pay if we were looking for one again. We are heading calgary way May long can deliver to SERIOUS buyers cost of fuel deposited. Please call 780-832-7829 to view. 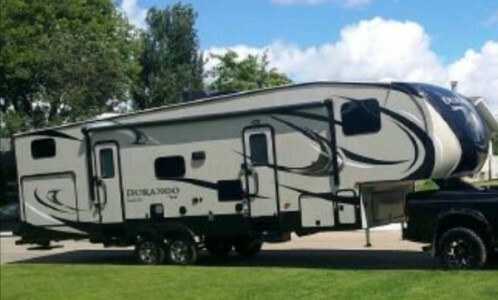 2011 Keystone Raptor 361LEV Toy Hauler. 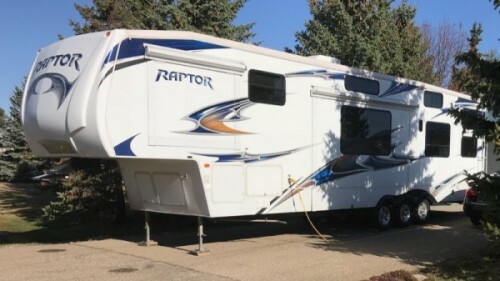 Here is an excellent condition Double Slide Raptor Toy Hauler with New awning fabric, New fender skirts, 12' Cargo Area, Mini Refrig with outdoor entrance, pass through basement storage, aluminum wheels with new tires, 2 - 30 lb propane tanks, electric fueling station. Loft w/2Queen Beds Above Cargo, LCD TV in cargo area, LCD TV with Fireplace below in living area, Refrig., 3 Burner Range/oven, Dbl. Sink, Booth Dinette, Sofa Slide, Pantry, Bath w/Corner Shower & Surround, Toilet, Queen Bed w/One Slideout Wardrobe, Overhead Storage & More! Options: Dbl. Electric Queen Beds w/U-Shaped Lounge in Cargo. 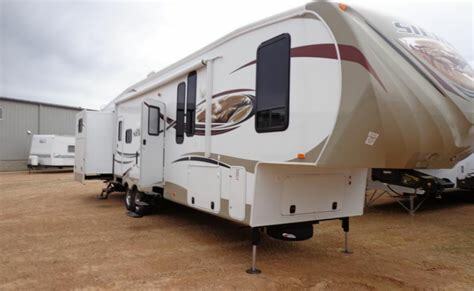 5500 Onan Generator, Stabilizer jacks, A/C with ceiling fan, Microwave, Stereo/entertainment center with interior/exterior speakers, option to watch TV outside, Exterior Shower and Enclosed Underbelly. Please call 780-614-1320 to view. 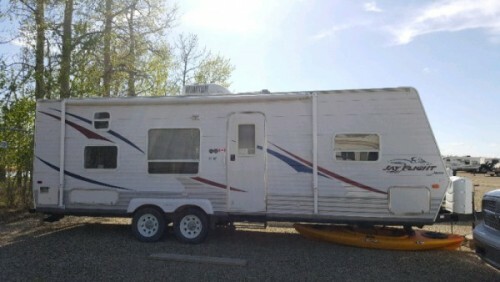 2007 Starcraft 13RT Trailer. Extremely Well-Maintained and Clean. Sleeps 6 Adults. 3 Way Fridge. Two Burner Stove. Suburban Propane Space Heater. Suburban Hot Water Heater. Cassette Toilet and Shower. Upgrade Solar Panel. Upgrade Upholstery. Heavy Duty Suspension and Square Tubing chassis. This trailer is Off-Road Capable and ready to get you off the beaten path and away from the crowds this summer. Ready to roll. Set up for viewing presently. Come take a look and get ready for the long weekend. Please call 403-969-3738 to view. 2013 Primetime Crusader 355BHC Fifthwheel. Amazing space and style with room for the whole family. There is a four bed separate bedroom with 1/2 bath at the back of the trailer with lots of space for the kids to spread out. A slide out kitchen opens up the living room, and the master bedroom has a slide out bed as well with full bath. Go outside and the luxury continues with an outdoor kitchen, electric awning, exterior light/sound. The trailer pulls great and is easy to park. The trailer has been stored in our heated garage since we bought it new. Most years we never went camping since buying it. Please call 403-318-5389 to view. 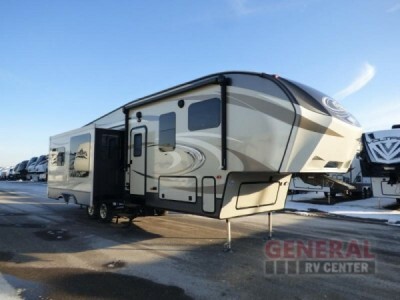 2014 Forest River Sierra 365SAQ Fifthwheel. All the conveniences of Home! Winter insulation package and 2 furnace heating system. King sized bed in master bedroom and 2 sets of bunks in bunkhouse with 2 piece ensuite at tail end. Master bath has shower toilet and sink vanity. Lots of storage and closet space. Washer dryer hook ups! Currently stored north of Fort McMurray! Please call 780-215-1950 to view. 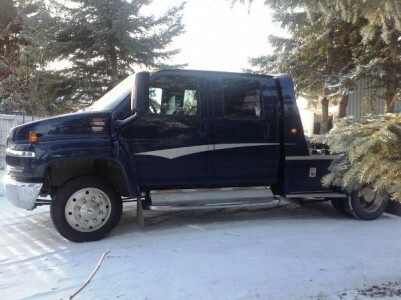 2004 GMC 4500 Topkick Truck. This truck was used to pull our RV trailer and only has 80,200 kms on it. Stored in heated shop in winter months. 6.6 Diesel automatic transmission with engine brake. Air ride on rear axels,also air bucket seats (leather) and bench leather seat in back. This truck has Power Window, Power Lock, air conditioning, heater in rear area, tilted steering wheel, Cruse control, DVD, FM, AM, CD, satellite radio, rear camera. All new tires d19.5 Can pull any 5TH wheel with ball or pin pull hook up. This truck is not a 4X4, and dont have air hook up for for equipment trailer. The truck is ready to go with three fuel tanks sat up with track two computer components. Please call 780-975-0681 to view. 2016 Artic Fox 25W Trailer. NO GST LIKE NEW (and smells like it)! Used 1 season only. A true four-season RV with certified off-road chassis and shocks on all 4 wheels. Fully welded, thick-wall aluminum frame construction. One piece continuous fibreglass exterior, high-density block foam insulation, wide body floor plan. Includes 30 Gal black water cart, 150 Watt solar panel, 3x max air covers, 2x 6V deep cycle batteries, Blue Ox hitch and sway bars plus many other items that make it camping ready. Luxury standard features (too many to list). Please call 403-797-1644 to view. 2015 Jayco Jay Flight 40FKS Trailer. Enjoy long-term camping stays in the 2015 Jay Flight Bungalow. With more space than a traditional travel trailer, thanks to a 96" interior height and a 102" wide-body construction, you'll feel like you never left home. It has all the comforts of home and packs a long list of residential amenities perfect for long-term stays (and for the weekend glamper). This is a front kitchen model that offers all sorts of residential appliances as well as ample storage and countertop spaces. Enjoy several standard residential features such as an 18 cu. ft. refrigerator with ice maker, ceiling fan in the living room and bedroom, 20" free-standing four-burner gas range with oven, a 60" sliding patio door, television and high quality audio system (indoor and outdoor speakers). The bedroom has been updated with a better pillow-top mattress for comfort that makes every night a good one. Feel right at home thanks to ample storage space. Bathroom doors are wide enough for convenient installation of stackable washer/dryer - 24" width (nice space allotted in the bathroom closet for this). Its home-like exterior features large windows for great campsite views, a residential-style profile and a 60” sliding patio door with Low-E thermal-pane glass. Also included is the power awning and ample outdoor LED lighting. Our family has only used the RV for 2 seasons. We moved to Calgary on April 1st into a lakeside community and no longer need the RV. Please call 204-771-8846 to view. 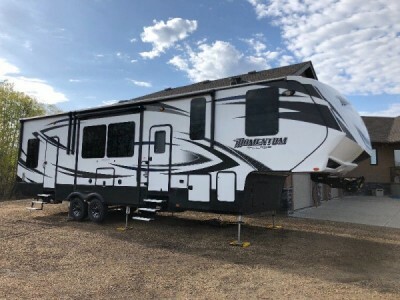 2012 Heartland Bighorn 3585RL Fifthwheel, This has many features, and is very roomy, in excellent and very clean condition. 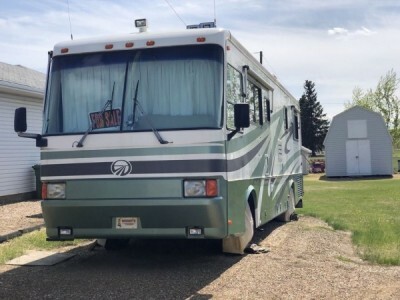 hydraulic landing gear and slides, 3 super slides, 4 door refer with ice maker, built in vac, gen set with remote start, auto sat dish, fire place, 3 flat screen TVs, and much more. Please call 780-231-8796 to view. 2017 Crossroads Sunset Trail Trailer. Excellent condition Sunset Trail. Original owner. Used only a handful of times. 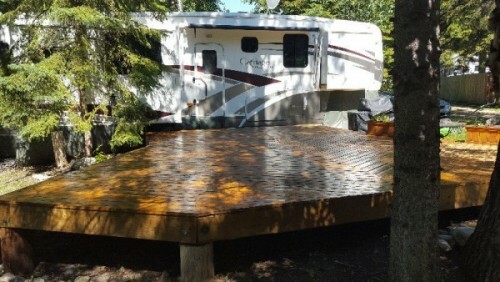 All maintenance done by Wild Mountain RV. Currently winterized. Price includes summer service to have the trailer ready to go. Located in Springbank. Aluminum Wheels. Black Tank Flush System. Tinted windows. 13,500 BTU air conditioner. EZ Lube Axles. Outside speakers. Electric patio awning with LED lighting. Manual stab jacks. Quick recovery 6 gal G/E DSI water heater (17.8 gal/hr). Swing-out assist grab handle. Spare tire. Nitrogen filled radial tires. LED Front Cap Lights. 30" Friction Hinge Entry Door. HD digital TV antenna. Satellite prep. Outdoor Kitchen. 2 entry doors. Docking station: 12v, USB port and 110 plug. Barreled interior ceiling. Tri-fold hide-a-bed sofa. Solid Surface Countertops. 60x80 Queen mattress. Seamless One Piece Counter Top. LED interior lights. Designer privacy shades. Pocket doors separating bedroom (VBM). Skylight in shower. Congoleum Flooring. Glass Top Flush Mount Range Cover. Stainless Steel Microwave. Ceramic Backsplash. AM/FM/DVD/CD Stereo w/ Bluetooth. Sink Cover. Please call 403-689-0613 to view. 2012 Adventure 23DS Class-C Motorhome. Ford E-350 super duty with V-10. This is an economical motorhome. Well maintained and serviced regularly, runs great. Newer in dash touch screen, back up camera, awning, and onboard batteries. This four season unit has double pane windows, insulated plumbing, enclosed tanks and heated basement. Sleeps six with over cab bed, corner bed and dining table folds. Please call 956-200-5518 to view. 2017 Grand Design Momentum 350 Toy Hauler. Factory ordered, fully loaded, there are no other options available that are not on this unit. Additionally, after market items include Satellite Dish; Air Cushion pin box, foam insulation under coating and rock guard. Please call 956-200-5518 to view. 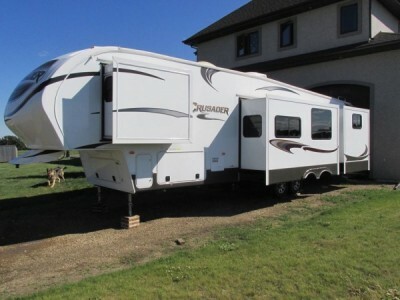 2012 Forest River Sandpiper 365SAQ Fifthwheel. Excellent condition. Overall length 42ft, 4 slides, sleeps 10, 2 dining room tables, remote control for slides-hydraulic legs-electric rear legs & awning. Belly is fully enclosed with tank heaters. 2 washrooms, 1 has access from outside door. King size bed in master, large closet, washer & dryer hook-ups, built in vacuum. Back room has 4 beds with large area and storage. Outside kitchen, outside speakers, entertainment system with TV in main area. Please call 403-350-8005 to view. 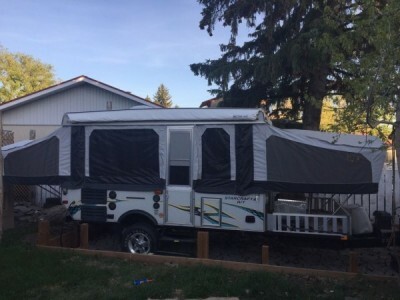 2001 Kustom Koach KW285 FifthWheel. Superior hard wall construction in this premier trailer by Travelaire. Power front landing gear. Queen sized bed with under bed storage. New pure sine wave inverter. Full bath and shower. Large fridge and freezer. 3 burner range with oven and a microwave. Dining room table with four chairs and fold out couch in large slide out which still gives access to the kitchen and bathroom when closed. Newer tires. Under belly mounted spare tire with BAL swing out mounting kit. LED bulbs throughout. New propane tanks. Dual batteries. New awning in 2017. Air conditioning with electric heat strip. Propane furnace. 10 gallon hot water tank. Many other features. Please call 403-333-5891 to view. 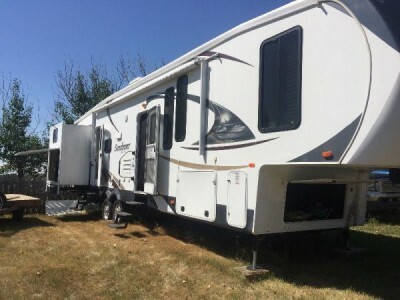 2016 Keystone Cougar 336BHS Fifthwheel. Quadruple slides to give you ample room inside for the whole family. Model 336BHS offers a private bunkhouse, a spacious combined kitchen and living area with dual opposing slides, a convenient kitchen island, and more! Step inside and see a wide open space with storage straight ahead. There are overhead cabinets, plus lower cupboards as well as a counter space. In the center find an island with more food prep space plus the location of the double kitchen sink. Behind it, find a refrigerator, three burner range with overhead microwave oven, and walk-in pantry with decorative glass top door. This all slides out along with a living area entertainment center including a 40" TV, plus overhead storage, and fireplace below. On the opposite side to the left of the main entry door find a booth dinette. This provides ample seating and also additional sleeping space when you have added guests. Head up the steps in front to a side aisle bath and front bedroom. The bathroom features a neo-angled shower, sink, and toilet, plus a slide out linen cabinet that is found along with the bedroom wardrobe slide. You can enter the front master bedroom through the bathroom, or from a private hallway door. Inside enjoy a comfortable nights sleep on a queen size bed with a nightstand on one side and wardrobe on the other. There is also overhead storage in addition to the slide out wardrobe that is connected to the bathroom linen slide as well. Back through the main living space head to the rear which is where you will most likely find the kids hanging out. There is a slide out jack knife with flip-up bunk above on the right, and a set of bunks on the left. Straight ahead through the bunkhouse door you will see an entertainment center with 32" TV. There is also a wardrobe just inside the door on your left for storage needs, as well as drawers beneath the bunks, and beneath the TV area too. On the outside you will find a rear outdoor kitchen that the chef in the family will love. There is a refrigerator, single sink, plus overhead storage, and so much more! Extended Warranty till 2020. Please call 780-573-5966 to view. 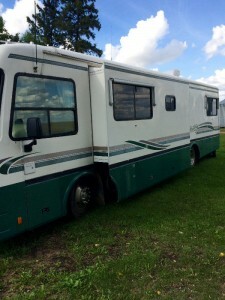 2001 Monico Diplomat 40FT Class-A Motorhome. This motor is equipment with a ISC cummins engine runs great 330 hp. There are all new awnings on as 1 year ago. All tires new less than 4000km on them. New coach batteries. Everything works in the motor home just installed a new circuit broad in fridge works great. All it needs this year is a oil change turn key load and go. Please call 780-720-8809 to view. 2017 K-Z Durango 292BH Fifthwheel. Sleeps 9 (queen size master bedroom, pull out sofa, dinette bed, 3 bunks). 1.5 baths (main bath with shower and powder room in master). Built in DVD player, out door sound system. 2 doors (main and bathroom). Plenty of interior and exterior storage (cupboards, closets and under beds, couches and dinette). Outdoor kitchen with attached BBQ, grill (gas lines plumbed in the rear for both), fridge, sink, cupboards and drawers. Rear bike rack and ladder. 2 auxiliary batteries, 2-30lb propane tanks. Classified as ½ ton towable. 5 years of extended warranty left. Gel Coat to prevent fading of exterior hard walls. Can include storage until June 24/18 and option for an additional year. Paid $70,000 plus warranty and paint protection. Please call Brent at 780-719-8311 to view. 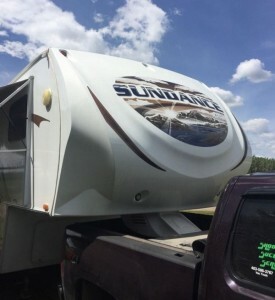 2011 Heartland Sundance 3300RLB Fifthwheel. 3 slides, new tires, 2 250 watt solar panel, 6 solor battries, skerting around the unit. Custom storage box. LED lights. Tripod. Camping gear. upgraded mattress. Cash, no paypal. Please call 403-586-3767 to view.